New York’s Trinity Museum located at the Trinity Church on Wall Street is hosting an exhibition dedicated to the concept of icons. Contemporary artists and the clergy united in the visual exploration of how the idea of the icon has changed in the 21st century. The show was assembled by Russian journalist Madina Stepanchenko and Scottish artist Darren Jones, both living in New York, under the auspices of their arts organization, Phenomena Project. “Soul Seekers: Interpreting the Icon” also shows how a fruitful collaboration between creative minds and spiritual leaders can be accomplished. Still, it is not without controversy. “Soul Seekers” has an international ambience, including artists from Russia, Serbia, the United States, Canada and the United Kingdom. According to the curators, the show was originally planned as a more traditional show, but eventually grew into something more provocative. Perhaps, the most challenging work of the exhibit is Jordan Eagles’ Blood Projection, covering the whole church interior in gigantic ruby red splatters. “Tintoretto’s Holy Grail,” hand-blown glass by Jeffrey Mongrain; Pavel Antonov’s “Snow Queens” in a white window frame; Aida Sehovic’s video “Apology,” exploring the war crimes trial of Slobodan Milosevic; and other works make “Soul Seekers” truly diverse and distinct. Jordan Eagles works a lot with blood and considers transformation and regeneration the core of his work. Usually he uses real blood “from something which is no longer living” that makes his creations relics, he said. They serve as an allegory of death to life, according to the artist. “The works allow a viewer to have a personal experience with a life force material they might not ordinarily see outside of the body but which runs through our veins and is universal,” Eagles told RBTH. One of the oldest Episcopal churches in New York is definitely an uncommon place for a contemporary art exhibition. Both curators claim the atmosphere of the church museum emphasizes the meaning of each artwork and gives the whole show an unforeseen impact. “A lot of tourists from all over the globe come to Trinity Church, so this is our message to the whole society,” Madina Stepanchenko added. A visitor to the Trinity Museum who wanted to remain anonymous told RBTH, “I am not OK with a contemporary art exhibition in a church,” and “there are plenty of other places for that.” Another man, a tourist from Houston named Miguel, said that he was expecting the show to be more religious-themed, but it turned out to be different and took him to another place. “But it was not a bad place, at all,” he assured. Surprisingly, the idea of an art show exploring the meaning of the icon came from the Trinity ministry. Stepanchenko and Jones were approached by Trinity Church about organizing an exhibition revealing some facts about the Orthodox icon. 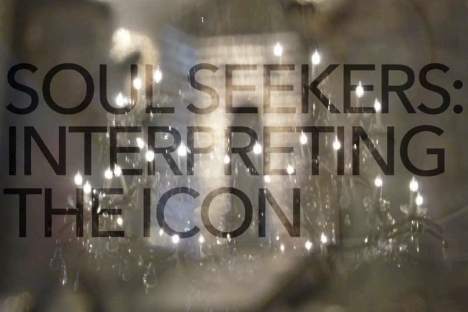 The exhibition "Soul Seekers: Interpreting the Icon" is open through July 31. John W. Moody, member of Trinity Church Arts committee and past chairman, talked to Russia Beyond the Headlines about the exhibition and its impact. RBTH: What does the icon exhibit mean to Trinity Church? John Moody: As I wrote in the catalog of the exhibit: The aim of our exhibits at Trinity Museum is to offer a consideration of contemporary visual art that contributes to current concerns, aspects, and questions addressed by the museum, gallery, curatorial, and art community in New York. We do this as a community of faith in an honest, intelligent, and inclusive way that tries to embrace the realities of art in a largely secular contemporary society. RBTH: Why is a church a good place for a contemporary art show? JM: Susan Langer, the philosopher, wrote that the arts are on the vanguard of civilization. Over the ages, artists and their art have been on the edge of culture pointing to and discovering the hopes, questions, fears and dreams of the age. The church, as a community of faith, wants to be a part of, learn from, and contribute to these realities of the times in which we live and share our lives. RBTH: Aren't you afraid to offend the more conservative part of the congregation? JM: Not really. The congregational Visual Arts Committee offers a broad range of exhibits and programs at Trinity spanning traditional and contemporary genres and interests. At present we share the museum calendar with an historical exhibit covering Trinity's 300-year history. We also have offered a traditional Icon Writing Workshop and exhibit and visual art exhibits addressing contemporary issues. JM: The congregational Arts Program at Trinity is part of Music and the Arts at Trinity, directed by Julian Wachner. It is such a privilege, in helping to organize this exhibit, to work with a journalist like Madina Stepenchenko and an artist like Darren Jones of Phenomena Projects. For us at Trinity it is a very enriching relationship as together we address aesthetically the questions and concerns of our time.